For a German translation, click HERE. Symbols have a special role in the building of any community. Having the power to unify ideas and concepts, symbols can serve as focal points of collective attention and energy, allowing for directed action. Communicating their messages in a deeper way than mere words, symbols have the power to reach inside our psyches causing real change, and making lasting impressions. Once a symbol holds meaning for us personally we can begin to identify with it, and by extension with others who feel the same. It is under these banners that kinships are formed; that families are made and celebrated, that our dead are mourned and remembered. Community being woven, strand, by strand, life by life. Sometimes these symbols are those that the community creates for itself. Sometimes they are thrust upon us. In the late 1930’s the Pink Triangle was used by Hitler’s regime (as part of their system for the classification of criminals) to identify a homosexual male. Females who were “unusable” by the regime (such as lesbians, prostitutes, and others who exhibited anti-social behavior) were given the Black Triangle. Used as a means to isolate and oppress, the triangle loomed dark over the heads of untold thousands of gay men and women, as they made their way to concentration camps for imprisonment, abuse, and even execution. 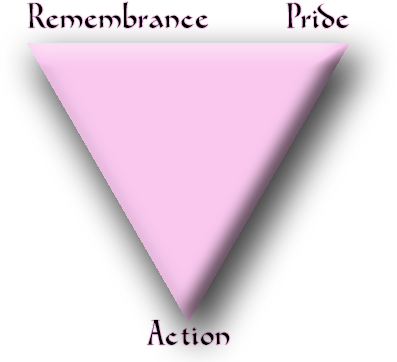 Resurrected in the 1980’s by ACT-UP (and inverted to represent fighting back) the Pink Triangle has since become a symbol of our individual pride for gay men, as well as lesbians, bisexuals, and transgendered persons. As well as being a reminder of what we’ve been through, it is also a promise to never again go silently. 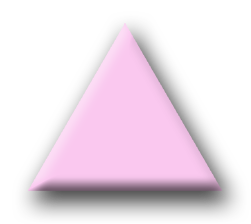 Some lesbian and feminist groups have similarly adopted the use of the Black Triangle to represent their unique voices in the cause. From all walks of life, under this banner, united. Once symbols have a history, they begin to take on power. Once symbols have power they can begin to communicate to us directly. What follows is a conceptual model inspired, in part, by my work in the Feri tradition (See The Iron Pentacle) as well as my own trance experiences while meditating on the triangle. The three points of the triangle represent forces that are in constant relationship with each other in a state of dynamic balance. When meditating on the individual concepts of the points, our psychic attention is drawn towards their essence. Through controlled breathing and attention we can enter into trance in which we can communicate with otherwise hidden aspects of ourselves, as well as with outside forces, all through the realm of the symbolic. Remembrance forms the first basis for our foundation. We must allow ourselves to learn from the past, both by recognizing past mistakes, and by drawing strength from our collective achievements. Our collective memory is the thread that binds us together. Our common history is what makes us brothers and sisters. When we remember, we rebuild. Pride forms the second “half” of our foundation. Once we have remembered our origins, and claimed them, we can allow ourselves to shine brightly; to allow our true selves to shine through. When in balance, Pride is never comparative, or condescending. Pride is the singular shining of the Now that burns from our hearts in fiery passion and love of life. 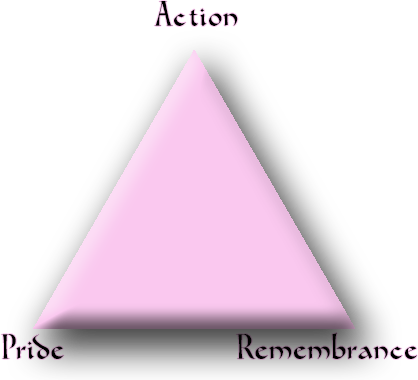 When the points of Remembrance and Pride are in balance, out flows the third and final point of the triangle: Action. Action is only in balance if it is rooted in the wisdom of the past, fueled by the passion of our pride in the present, and guided by our vision to the future. Only through balanced and sustainable action can we hope to achieve change. Sit comfortably and perform a suitable grounding exercise. Try to achieve a relaxed and open state. When you have begun breathing in a slow rhythm, light a candle, and begin to visualize the appropriate triangle (Pink, Black, etc.) hovering before you… one point down. Breathe deep, and imagine that you are breathing through the triangle, and into your heart-center. Do this for the span of at least 9 breaths. Remember our myths… pieces of power and wisdom from across the sea of time and space. Remember how we were important, powerful, sacred. Our different-ness is a gift that we must find. To some it is to stand in between… to others to stand outside… still others are empaths, healers, mirrors… What is your gift? Breathe deep, and allow the triangle to grow with every breath. Feel the points in your body, in your hips and the center of your forehead. At your right hip, Remembrance, at your left hip, Pride, and at your 3rd eye Action. Feel the energy of the points move in order… Remembrance, Pride, Action… Remembrance, Pride, Action… Allow it to flow through you, carrying away any debris that it may encounter. Continue breathing slowly and deeply in a rhythm and allow the power of the points to move faster, and faster as you do. Do this for at least 9 breaths. Now allow the movement to slow… now to a halt… now going backwards… Action, Pride, Remembrance… allow each point to flow into the next… Allow the wisdom of your Pride and your Action in the present, to flow backward into your past to heal that part of you that felt belittled or silenced for being different. Simply recall those past moments and allow the energy of your current Pride and Action to permeate them. Allow the points to flow in harmony with each other… notice if they seem different now. Still feeling the energy moving, begin to absorb it into your body in the span of three deep breaths of power… Absorb the energy into your heart-center, and then move it down to your power center (beneath your navel). You might also try experimenting with different postures. Moving the energy between each hand and the forehead as you sit meditatively might also prove useful. Try to see what memories or insights that arise as you perform this exercise and, as always, write them down! Keeping a journal is an important part of the journey. Blessed be!